September 25th marked the Membership Kickoff for our 2019 Grant Pool. We convened at the Nora Library, where 40 members and guests had a chance to talk one-on-one with our 2018 Change-Makers and Change-Maker Finalists. We were inspired to learn that these agencies have already embarked on changing our community for the better. Each agency then addressed us all — focusing on how their programs and our grants were helping the kids of our community. The Indianapolis Star helped us set this theme by their reporting on our Annual Awards Celebration, where the headline was “Indianapolis youth are the big winners in Impact 100 Change-Makers grant contest”. NeuroHope of Indiana has recently also been featured in an Indy Star article regarding the help it was providing to a high school student who had suffered a traumatic brain injury as the result of a car accident. 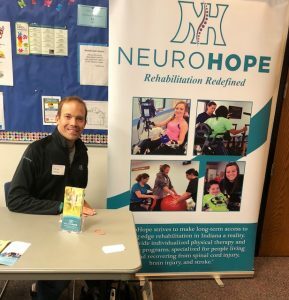 Chris Leeuw, Founder and Executive Director, explained the history of the organization and the work that they do – providing long-term rehabilitation for individuals recovering from neurologic injury in Indiana. Our grant is one of many sources that NeuroHope uses to support the services it provides. Learn more at www.neurohopewellness.org. 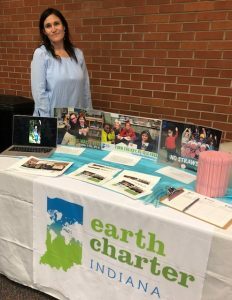 Earth Charter Indiana continues to educate kids in the ways that they engage in improving the environment, particularly in relation to climate change. Its program educates young people through a combination of STEM education and civil leadership training. Jim Poyser, Executive Director, gave an example of students who were working on zero-waste cafeterias. It was exciting to learn about young people taking a leadership role. Learn more at www.earthcharterindiana.org. Kennedy-King Memorial Initiative is continuing its efforts so that today’s youth are aware of the history of the civil rights movement, particularly the important events of April 4, 1968. 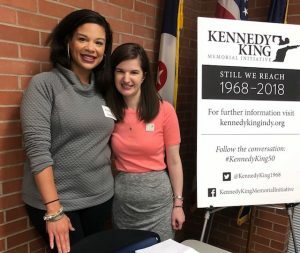 Ashley Gurvitz, Board Member of the Kennedy-King Memorial Initiative, provided personal insights into the importance of providing education on the values of equity, justice, and non-violence. Our grant is being used as part of their educational efforts around the 50th anniversary of the death of Dr. Martin Luther King. Learn more at http://kennedykingindy.org. Trinity Haven will be providing safe transitional housing for homeless LGBTQ youth ages 15-21. Leigh Ann Hirschman, Warden of Trinity Episcopal Church, gave us an example of the problems faced by many LGBTQ youth who are turned out by their families. There is not a single shelter for homeless LGBTQ youth in the state. Trinity Haven will provide that shelter and will provide a model that can be replicated throughout Indiana and even the country. Our grant will help with the renovating the space that has been secured for this purpose. Learn more at www.trinityhavenindy.org. 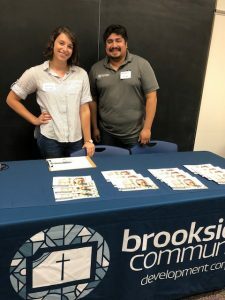 Brookside Community Development Corporation has already begun implementation of its Education and Employment Academy by hiring a Program Director, using funds providing by Impact 100. According to Andrew Neal, Director, the Academy is offering afterschool programming for middle and high school students – focusing on character building, leadership development, mentoring, academic support, and post-secondary planning. Learn more at www.brooksideplay.org. Karen Holly, Impact 100 VP and Membership Chair, closed out the evening by explaining how the Impact 100 grant process works. She emphasized that Impact 100 can only succeed if women come together and pool their resources to support excellent programs such as those we had heard about tonight. She provided membership materials for those wanted to support us in 2019, available on our website at https://www.impact100indy.org/join/. This entry was posted in Grants, Membership Information, Nonprofit News, Previous Grant Winner News and tagged Brookside Community, Earth Charter Indiana, Grant Winner News, Grants, KKMI, NeuroHope, Trinity Haven on October 2, 2018 by Impact 100 Indy.